Readers from Melbourne will probably guess this was written a couple of days ago, at the end of a heat wave. But today seemed a good time to post it: it’s Australia Day. For all who feel at home where they live – and for those who don’t. It’s been breathlessly hot for days. At night, it’s hard to sleep: we have to choose whether to close the window and swelter in the stuffy room, or open it to invite in the occasional puff of air and the mosquitoes. Last night we opened the window and risked the mosquitoes. As I leaned on the window sill and savoured the cooling air, I heard a munching noise from our persimmon tree. I could see leaves moving, and glimpse a furry face in the gloom. 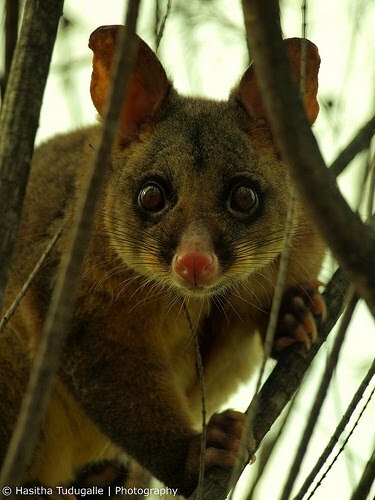 I shone a torch in its direction, and sure enough, there was a fat old possum, munching on a green persimmon. I’m not sure how he can bear it! I’ve tasted a persimmon far riper than the ones on our tree, and it shrivelled my tongue. The possum is an old friend. As I sit on the couch and sip my morning coffee, there he is, regular as clockwork, trundling along the fence. He’s twice the size of a small cat and twice as heavy as a large one, solid with muscle and fat. I’m not sure how he can move his bulk along the narrow fence. He waddles, balancing himself with a thick, fuzzy tail, and the leaves of the persimmon tremble as he disappears behind them. I don’t know where he sleeps during the day, but it can’t be far away. Last night his eyes gleamed red in the torchlight. I said a mental “Goodnight” and retreated to the wrinkled sheets of the bed. When the night’s this hot, I don’t sleep deeply: I doze, half-waking to the heavy scent of eucalyptus oil hanging in the still air. I breathe it in, and the mosquitoes don’t seem to matter. Like so many generations of Australian children, I grew up on the literature of Britain. The oaks of Narnia and the elms of Middle Earth marched across my imagination, and the grey-green eucalypts of Australia didn’t quite measure up. This wasn’t helped by the cutesy gumnuts Snugglepot and Cuddlepie or the unlikely antics of Blinky Bill: Australian children’s literature hadn’t yet come of age. Hopefully, it will be different for my own children, thanks to authors like Alison Lester and John Marsden; but I’m only starting to feel like I belong here. This morning I sat on our back veranda and listened to the dawn chorus. Which makes it sound far more ethereal than it is! No robins or thrushes here. Not even the Australian equivalent, the unearthly carolling of the magpies or the gurgling of the kookaburras; instead, the gums behind our house explode every morning with a flurry of buttercup-and-white feathers and the screeching of the cockatoos. They prance up and down, display their crests, jostle for position, play king-of-the-branch, and goggle at me with reptilian eyes. There’s a pause in the cacophony, and a quiet breeze rustles the wattle leaves. The cool change is coming. And suddenly, I know it: this is my place. My country. For a little while. To live in one place and long for another is good training: you learn to long for heaven. To live in a place and love it is a different kind of training: it gives you a foretaste of what is to come. Because however at home I feel here, this isn’t my homeland. I belong to a better country. In Jesus, I have finally found the way home.